I'm not going to lie- when I noticed ice cream recipes popping up left and right without the use of eggs, I was a little skeptical. Actually, I was more than skeptical, I was in disbelief that the ice cream 1. would freeze like ice cream freezes and 2. would have that luxurious creamy consistency I just love about homemade. You see, there's definitely a reason good homemade ice cream starts off with that custard-y base made with egg yolks. The French knew what they were talking about. It creates the thickest most divine texture as well as this amazing full bodied cream flavor a good ice cream should have. Yes, it's harder work. Yes there's a chance, if you don't know what you're doing, that you might curdle your eggs ruining the whole thing. BUT WHEN (not "if", "when") you get the hang of it- I promise you will not be unhappy with the result. So, of course not believing the whole "no egg" recipes out there I created and posted my own recipes using the custard base. Like this one, and this one, and this one. I even had my eggs-only-club version of coconut ice cream. But those easier ice cream recipes continued on. Week after week I saw more and more eggless recipes popping up and tempting me to try once more. 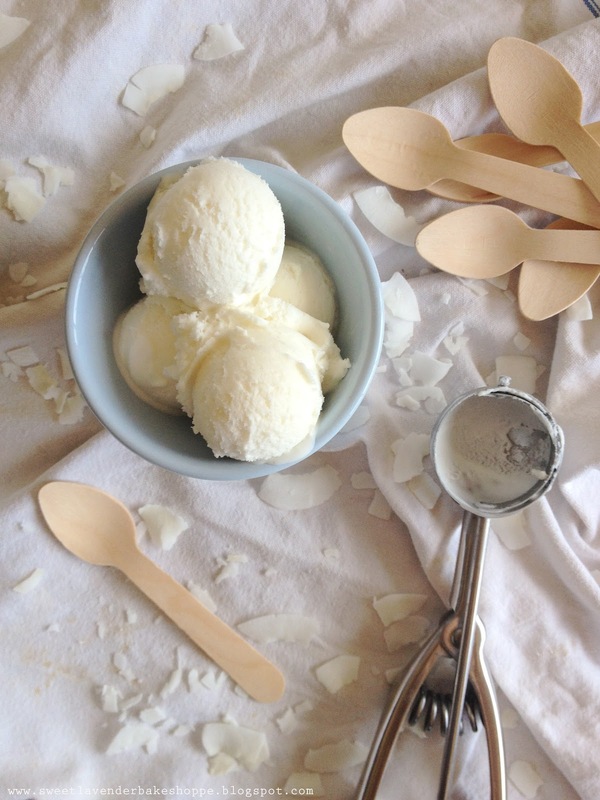 I tried and tested and came up with my own coconut ice cream recipe....egg free. Again, I won't lie...it was amazing. It was still creamy. It was still custard-y. It churned and froze just fine. It was still absolutely yummy even though my beloved eggs weren't included. AND...it was definitely...easier. I can almost hear my Le Cordon Bleu cooking education swirling down the drain while screaming "traitor!!" This couldn't be easier to make, seriously. 1. In a small sauce pot add your heavy cream, coconut milk, and sugar. Cook over medium low, stirring occasionally until just about to simmer. 2. Once about to simmer, turn heat to low and cook stirring occasionally until sugar is dissolved- about 1 minute. 3. 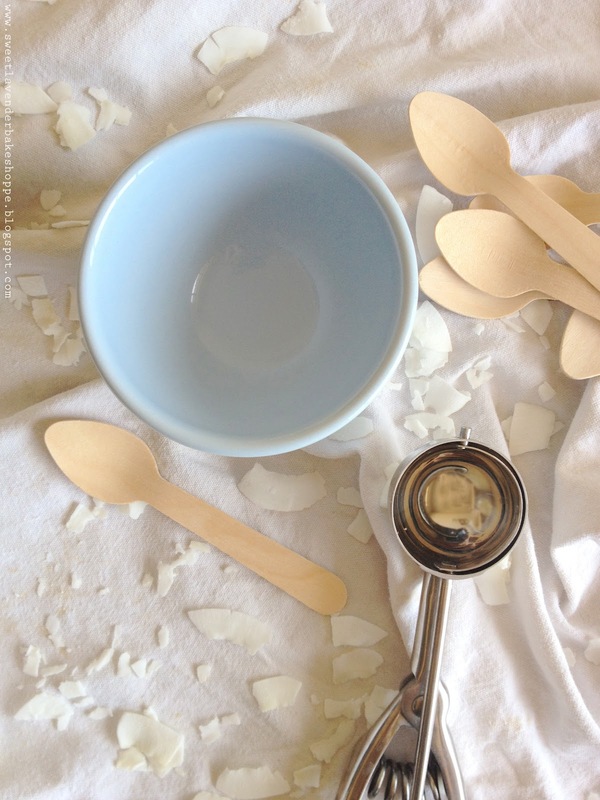 Remove pan from heat and stir in coconut extract, vanilla extract, and salt. Stir well. Allow to cool in pot for about 15-20 minutes. Once cooled, add to a container with tight fitting lid and place in fridge for about 8 hours or best, overnight. 4. Next, stir coconut custard once more, pour into your ice cream maker (which is already running! Never add ice cream base to a standing-still ice cream maker) and churn according to your maker's instructions. You're looking for a soft serve consistency as well as an increase in volume. For my Cuisinart this took about 17 minutes. Of course, homemade ice cream (of any sort) is meant to be shared! So, share away friends! your pictures and styling are gorgeous. I am looking forward to trying. I have had a lot of "melty" ice creams. Isn't that like, the worst? I understand ice cream melts...but it shouldn't melt as quick as some did! I want my ice cream to still be ice cream when I go to consume!!! Thank you SO much for the kind words!! That's a huge compliment coming from you!! I mean that. Let me know how that ice cream making goes!! Is there anything better than ice cream ever?? Well, okay eggless ice cream that still tastes awesome! I will be trying this!! Can't wait! Very good recipe thank you for sharing this recipe, will try this very soon. 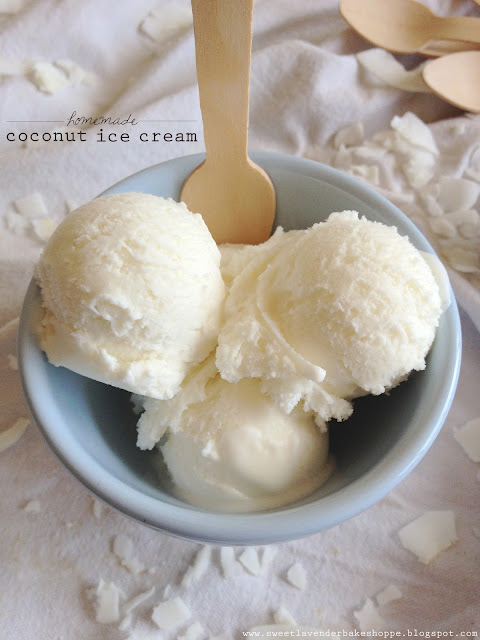 Glad I found this recipe, my husband was talking about coconut icecream last nite. 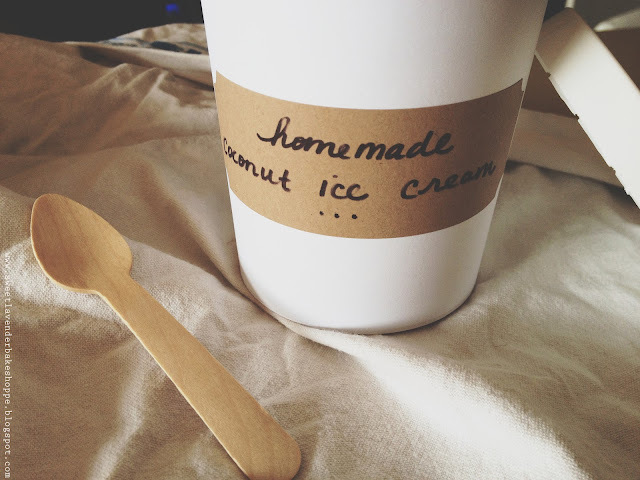 I go a maker a few weeks ago and have made 2 batches of icecream. A really nice vanilla one and a vanilla one with chocolate swirled through it. Both recipes were eggless just to start lol. Looking forward to getting the ingredients to make the coconut one !!!! This is so perfect, eggless and easy, can't wait to find out how it tastes! This one great ice cream and what I'm amazed of is it's egg free. Thanks for posting this recipe. what type of labels do you have? What type of label did you use? hi. would like to ask will your ice cream feel a bit icy after made? Hi there Shawn! You know, for this particular ice cream, it was totally NOT icy! I was a little skeptical too, before making. I was a BIG custard based ice cream maker. But to my delightful surprise, this came out very creamy :) Just make sure you follow your ice cream machine's churning instructions! This recipe is exactly what I was looking for, elegant and easy, thanks! !